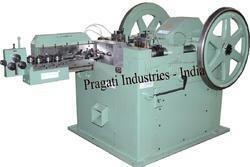 Leading Manufacturer of wire nail making machine from Rajkot. This products has a new feeding system (gear feed ) which permits the usage of large wire bundles and helps maintaining close tolerance. Manufactured using high quality components and spare parts, these machines are in tandem with international quality standards. The Lubrication parts are served by centralized automated cyclic lubrication system. Due to the optimization of moving parts, the guide & the bearing wear are reduced. The balanced critical parts causes low vibration & enhance life. Our harden ground wedge type die box has a long life and easy low cost refurbishing. Theis product has a new feeding system (gear feed ) which permits the usage of large wire bundles and helps maintaining close tolerance. 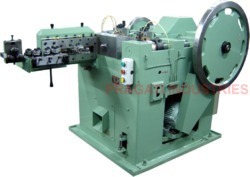 Manufactured using high quality components and spare parts, these machines are in tandem with international quality standards. This product has a new feeding system ( gear feed ) which permits the usage of large wire bundles and helps maintaining close tolerance. Manufactured using high quality components and spare parts, these machines are in tandem with international quality standards. This product has a new feeding system (gear feed ) which permits the usage of large wire bundles and helps maintaining close tolerance. Manufactured using high quality components and spare parts, these machines are in tandem with international quality standards. 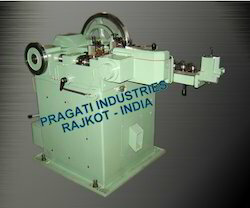 We are a coveted organization that is engaged in manufacturing, supplying and exporting high quality High Speed Wire Nail Making Machine. These products have a new feeding system (gear feed ) which permits the usage of large wire bundles and helps maintaining close tolerance. 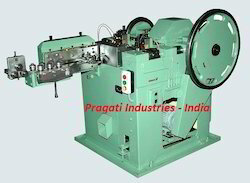 Manufactured using high quality components and spare parts, these machines are in tandem with international quality standards. • The Lubrication parts are served by centralized automated cyclic lubrication system. • Due to the optimization of moving parts, the guide & the bearing wear are reduced. • The balanced critical parts causes low vibration & enhance life. • Our harden ground wedge type die box has a long life and easy low cost refurbishing.